Well, it appears that youth and skill CAN triumph over “old age and treachery” — at least in the world of IBS benchrest competition. Here’s a feel-good story that should give us confidence in the upcoming generation of new shooters. A month ago, Henry Miller won the IBS benchrest match at Dunham’s Bay, New York. Henry shot a .2698 Aggregate to top 21 other shooters. That sounds like a standard headline for most any benchrest event, doesn’t it? In the case, however, it was rather exceptional. You see, Henry, the son of long-time benchrester Scott Miller, is just eleven years old. It was an impressive performance by the young man — conditions for the March 22nd match were difficult. In fact, only two shooters finished under .300 for the 100-yard, five-target average. Scott Miller introduced son Henry recently to the world of benchrest competition. In addition to Dunham’s Bay, young Henry has shot at Pine Tree Rifle Club in Johnstown, New York and at Bell City in Connecticut. By the way, Henry beat the Euber brothers (both Hall of Famers) and other veteran shooters many decades older than he. Well done, young man! 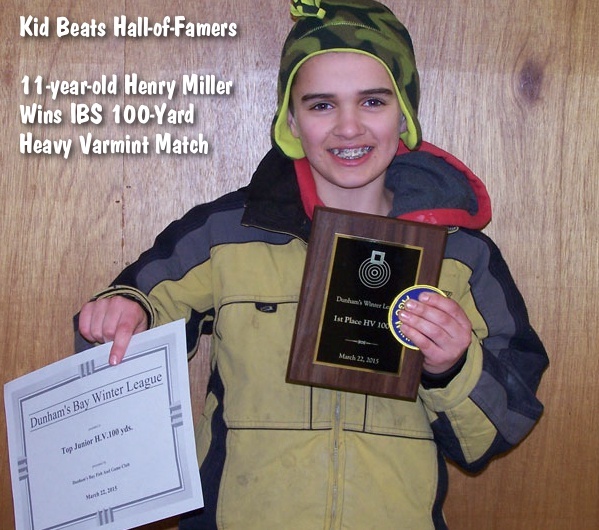 Share the post "11-Year-Old Wins IBS Benchrest Match"